Time of realization: March 1 - 3, 2011. March 1-3, 2011 at IEC Crocus Expo there being held 4th edition of Composite-Expo 2011 exhibition - a leading international specialized event in composite industry in Russia, where full range of manufactures of raw materials, equipment and finished products of composites is widely introduced. 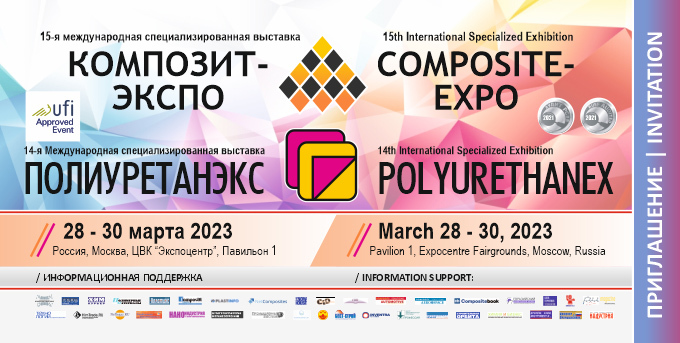 The target of the Composite-Expo is to boost the Russian composite market, development and introduction of composite technologies and materials in different branches of industry: aircraft engineering, automobile manufacturing, construction, housing and others. In comparison with the last year display area increased by more than 80 percents. Among the exhibitors were the following companies: AirTech Europe Sarl, Nalchiksky Composite Materials Plant Ltd, Graco BV, Al't-Vest LLC, Bautex LLC, Prepreg-SKM CJSC, Polotsk-Steklovolokno JSC, P-D Tatneft-Alabuga Fiberglass LLC, Evonik Chimia OOO, STEKLONiT Management, Master Model LLC, Stupino Glass Reinforced Plastics Plant LLC, OCV Steklovolokno JSC, Carbon Studio, Mikrosam AD, Zoltek Zrt., Novye Uglevolokonnye Matrialy LLC, Intrey LLC, Composite group, Chongqing Polycomp International Corp., Glasstex Group Corp. and others. March 1, 2011 within the business program of the exhibition there being held a Seminar of Composite Holding Company which consisted of the following reports: "R&D to Facilitate the Development of Competitive Carbon Fibre-Based Polymer Composites" and "Carbon Fiber Materials Manufactured by Holding Company Composite". March 2, 2011 within the business program of the Composite-Expo exhibition there being held the Current State and Prospects of Development of Production and Use of Composite Materials in Russia, 4th Practical-Research Conference, organized by Union of Composites Manufacturers and Mir-Expo Exhibition Company LLC. During the conference there discussed the matters regarding composite materials manufacturing and use, and main problems of Russian composite market development and the ways of their possible solutions. At the conference the specialist of the many Russian and foreign companies took part. They are as follows: Dow Europe, Mikrosam A.D., NGK-Kompozit, UTS-Logistika, Owens Corning, Delkam-Ural, Mashdetal (Cental Scientific-Research Institute JSC), Alstrom Tver', Bautex and Ukrainian Technological Academy. Within the Conference there being held a plenary meeting named "Obstacles and Motivations of Russian Composites Industry Development", organized by Union of Composites Manufacturers and Delovaya Rossia (union of businessmen). Representatives of All-Russian Scientific Research Institute of Aviation Materials (Federal State Unitary Enterprise), RUSNANO, All-Russian Scientific Research Centre of Standardization, Information and Certification of the raw products, materials, and substances took part in the plenary meeting. At the same time with Composite-Expo, the International Specialized Exhibition POLYURETHANEX ran for the third time and allowed a wide range of specialists to get acquainted with innovation technologies of manufacturing and samples of finished products of polyurethane materials for different branches of industry and the 3rd International Specialized Exhibition "Innovation Materials and Technologies" including the following sections: Magnets, High-Pure Materials, Technical Ceramics, Functional nanomaterials, Rare Earth Metals. Having a few exhibitors for now, the exhibition, in exhibitors' opinion, has great prospects of developments. The majority of the exponents showed the intention to take part in the 5th International Specialized Exhibition "Composite-Expo" next year. It's planned to be held in February 28 - March 1, 2012 in Crocus-Expo, Moscow.